“The Master” opens on a shot of the marbled blue-white wake of a battleship, and director Paul Thomas Anderson returns to that image several times throughout the film. Soon, it becomes clear why; the image embodies the film’s subject, the muddled and mysterious history that we leave behind us, specifically the history of one sailor returning to America after World War II. 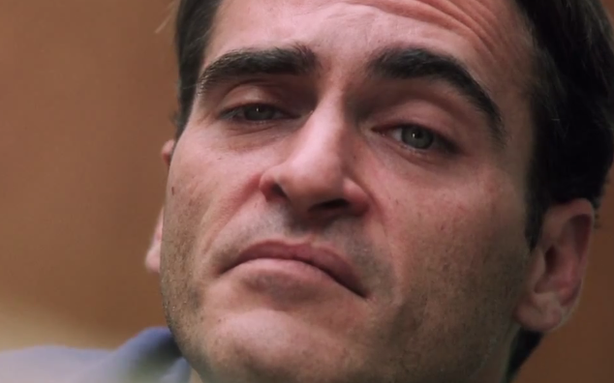 The young man in question is Freddie Quell (Joaquin Phoenix), a loner and an alcoholic, whose troubled mind has been further perverted by the fog of war. Every alcoholic has a past that is either the cause of their drinking or the result of it, and Freddie is no different. He works a series of odd jobs, each of which he is forced to leave due to his erratic behavior. One evening, he stows away on a luxurious yacht, where he meets Lancaster Dodd (Philip Seymour Hoffman), a “writer, a doctor, a nuclear physicist, a theoretical philosopher, but above all…a man.” He is also the charismatic leader of a mysterious movement known only as The Cause. There has been much speculation that The Cause is a thinly-veiled version of Scientology, and Anderson has confirmed that he was inspired by L. Ron Hubbard. But once the film takes flight, the comparison quickly recedes into the background. Hoffman’s Dodd is a unique creation, rife with contradictions, one of the many dysfunctional father figures that have dominated Anderson’s films. But the dynamic between Dodd and Freddie is not as simple as that of a father and son. They complete each other like doomed lovers; Freddie is the tortured soul that Dodd has been searching to save, brought to him by chance or perhaps cosmic convergence. Even Dodd’s wife (Amy Adams) immediately recognizes that Freddie “seems to inspire something in him.” In many ways, “The Master” is a platonic love story between two deeply troubled men, both of whom need direction, neither of whom is qualified to give it. After spending the day together aboard the ship, Dodd puts Freddie through his first “processing session,” in which he uncovers Freddie’s past traumas through an intense series of questions. It is the first of several masterful scenes between Hoffman and Phoenix, and Anderson wisely cedes it to the performers, letting the camera linger on Phoenix’s creased, expressive face for what seems like minutes at a time. While Dodd takes Freddie under his wing and sets about “curing” him, we bear witness to his methods, which involve physically and emotionally breaking Freddie down. Both actors are tremendous, but Phoenix has the bigger haul, and he gives an exhaustive performance. Neither his face nor his body are ever truly at rest – he holds his shoulders in front of him as if constantly wearing a suit one size too large, and his facial muscles, even when still, seem to ripple with tension. Still, the crux of Dodd’s method is not physical; it is a journey back in time, through something similar to hypnosis, in order to access old memories from this life and from previous ones. He claims to be able to “time travel,” and his followers, hungry for answers, believe him. At this point, I could not help but notice that Lancaster’s methods bear some similarities to Anderson’s, who is as much an historian as a filmmaker. In “Boogie Nights” and “There Will Be Blood,” he revisits and explores iconic periods in American history. His other films are set in the present but feature characters struggling to escape the ghosts of their pasts. His first feature, “Hard Eight,” tells of an aging gambler seeking redemption for his past crimes in an unusual way. Barry Egan in “Punch-Drunk Love” is in a state of arrested development, still stuck in the emotional patterns formed as the younger brother of eight older sisters. And nearly every character in “Magnolia” is seeking to find their own voice after years of being defined by feelings of abandonment. As several characters in that film state: we may be through with the past, but the past ain’t through with us. 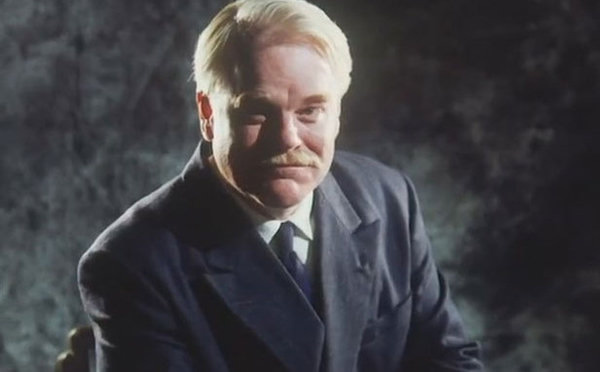 “The Master” combines both ways that Anderson has previously addressed the subject of history. It is an inquiry into one man’s past but also a period piece, and the misc-en-scene is filled with authentic details that dig deep beneath the image of ‘50s suburbia that has become American legend. Many contemporary films, including “Far from Heaven” and “The Hours,” have sought to expose the emotional life repressed beneath the façade of post-war conformity. “The Master” never bothers with the illusion – instead, the details create a living world free from the confines of legend – and tells a story far more emotionally raw than we have come to expect from films set in that era. But the question remains: why has Anderson brought us back to this time? What do we have to gain from examining this period in history? Freddie’s journey is meant to be representative of all who return from war – an early scene places him as just one in a room of soldiers, as they are warned of the difficulties they will have in returning to normal life after what they have seen. How will they reconcile the darkness of war with the light of post-war optimism? Anderson seems to think that in times of collective existential distress, we seek moral certitude wherever we can find it, and it is impossible to ignore the parallels to our current socio-political climate. We can read “The Master” as an allegory that shows how contemporary America is adjusting to a new reality brought on by a different act of war – 9/11 – and how we have reacted to the destruction of our old moral order by clinging to new certainties. In one crucial scene, Dodd’s methods are questioned by a skeptic at a party. Their exchange, in which Dodd becomes increasingly agitated and defensive by a set of simple questions, reminded me of nearly every talking head I have seen on cable news of late – the kind of pundit that is wrapped so tightly in his or her narrow philosophy that real engagement becomes impossible. Freddie Quell gravitates towards Dodd’s certainty, but those of us who are desperate for such moral certitude today must choose between Glenn Beck and Bill O’Reilly or Rachel Maddow and Bill Maher. Anderson is not one to imbue his films with lessons exactly, but the end result of Dodd’s work to cure Freddie of his ills is instructive. Freddie takes on many of the Master’s qualities and especially his contradictions – Dodd’s certainty begets Freddie’s fierce devotion to The Cause – but he never sheds the problems that led him there in the first place. He remains violent and impulsive, like a dog who is given enough food to stay alive but deprived of everything else. Through this tumultuous relationship between two very strange men, Anderson asks his audience what a person – and a nation – are to do when they come face-to-face with the world’s darkness. Anderson respects his audience too much to simply answer that question for us. The inevitable conclusion is that, more than sixty years after the era that the film portrays, we are still not ready to answer the question for ourselves. ← Did “Parks and Recreation” Peak in Season Two? This film only shows PT Anderson is very good at imitating PT Anderson. The Master is a long, slow mess where motivation & plot disappear into Anderson’s lovingly crafted shots and Greenwood’s There Will Be Blood reductive score. While that film had power, money & ambition to anchor its ethereal movement, The Master has nothing in the way of explanation for the relationship between its characters. Is it a scam? Is Freddie a convert, believer & protector? Why does The Master care for him? By the time an entirely pointless motorcycle ride in the desert comes you realize its a metaphor for this film and you just want to go watch The Avengers again. Freddy’s journey to following The Master is not developed properly and his motivations thus make no sense. The Master certainly is charming and persuasive at first, but his deeper ability to be called Master is missing. His motivation most certainly is as well…is it money? Power? Does he believe? Where did he get these crazy ideas (the public fiction or cynical truth are both nowhere, we are left “reaching for air” as Ebert so aptly put it in his review). There are small, wonderful performances by Amy Adams that suggest her own power, but it is nothing more than suggestion. Naked people appear magically…is it a dream, a metaphor? Who cares if you don’t know how. No one seems to mine much this drunk stowaway has become a separate inner circle for The Master, and when they do, at dinner, the next time we see them THEY DON”T CARE. Its a cult around a single figure, there’s going to be power plays galore…not here. Hell, everybody seems to be good as does The Cause. What about the son? No jealousy? Seriously? The daughter? Why would she make a pass and then say she wanted him gone? Why would her husband go rough up a guy with Freddy, a guy we just saw stealing? Why would Freddy do that? The motivations are inconsistent, and they lead nowhere. They don’t count as power plays if no one wins. Hell, its the beginnings of a movement, there are critics and agents & The Master goes to jail and everybody’s just hunky dory sitcom satisfied with their social status. A weak film, beautifully shot with amazing performances, but run through with Sophomore Lit Meanings and Archetypes in place of plot and meaning. However, “we have struggled against the day and won!” is a wonderful line and my new motto. This film certainly inspires diverse opinions. Thanks for sharing. My pleasure…i’m glad you enjoyed it at least. I’ve love to hear an explanation as to how Maddow and Maher compare to Beck and O’Reilly. The false equivalency that commentators seem to feel is necessary in order to establish that they’re not taking sides gets a little bit ridiculous at time. Maher is a comedian who regularly has conservatives, including people like Ann Coulter on his show and allows them to make their points. Maddow is a commentator with a viewpoint, but she’s hardy one of the blowhards like beck and O’Reilly. When was the last time either of the conservitves mentioned allowed a liberal to be on their show to make liberal points without being ridiculed, interrupted, and shouted down? It’s become all too typical to boil things down to Left vs Right, so Gittell lumps in Maddow with the likes of Glenn Beck and Bill O’Reilly. The dying legacy media is pinning their demise on partisan media as well. They have to pin it on something…..anything as long as their is no self reflection, no hard looks in the mirror….nope, it’s the partisanship. Personally, I think FACTS are the only standard. I guess that’s why I don’t work in the media. We’re supposed to believe that someone on the Right like Beck or O’Reilly, who consistently fudge facts if not outright mis-represent them, are equivalent to Maddow, who as far as I can tell is pretty dedicated to FACTS, despite her obvious political bent. Hell, she even apologizes on air when she gets it wrong, but she’s clearly from the Left so we must dispense her conclusions because the truth only exists in the middle. Except all I see in the center are a bunch of shrugged shoulders….who knows what the truth is……we report…..you decide. There are those that say 2 + 2 equal 5…..let’s bring in a Democratic consultant and a Republican consultant to argue about it. The Socratic Method need not apply. If one were to use the Socratic Method, they would be in danger of ending up siding with one side or the other of our political spectrum. Better to keep it factless and in the middle, or else we as a nation might end up in some pointless ruinous war, or on the brink of economic collapse as a result economic voodoo. We certainly wouldn’t want to base our moral certitude on anything but wishy washy Beltway cocktail party conventional wisdoms, the ones that have served us so well. SO the next time you find yourself being confronted with facts Noah, facts that may lead to anything but the milquetoast middle, please retreat tot he safety of something along the lines of CNN…..”There are those who say 2 + 2 equal 4…..”. ReelChange — This is your best work yet. Beautiful, thoughtful piece and you really seem to grasp this movie and the director’s work. Commenters — You probably don’t work in the media because you are terrible at reading something, understanding what you’ve read, and then conveying your opinion in a logical, comprehensible manner (not that the media can claim that to be a strength of theirs these days either). All of you on here with “comments” are just using this in the same way the talking heads on cable use their shows. You don’t care about the point the other side is trying to make and how legitimate it is, or even about hearing another person share their perspective and being an individual thinker. Rather, your point is to spew your narrow-minded opinion any chance you get. None of you should be allowed to comment on message boards in case someone with an open mind actually reads it and allows your poisonous dribble to influence them. People are allowed to disagree with one another and still be decent and civil. So unless you can make your point in a more coherent, less divisive way please just keep it to yourself. The writer of this article also happened to respond to all of your comments in a polite, respectful manner. All of you could learn something from that attitude. By the way, do any of you actually WATCH Rachel Maddow?? She constantly raises her voice and makes her point in a radical, dramatized way. THAT is the same thing those on the right do. Everything is for ratings on both sides and all of them are dogmatic. You are a child. As such reasoning with your is a lost cause….but I find myself bored. So raising your voice is the issue? Not the facts? Your mother is calling you…..time for bed. That’s a very adult statement. Thank you for your poignant demonstration of the Dunning-Kruger Effect. Tell your stories of Dunning Kruger to someone else Skippy, the Air Force says I test at 135. Clearly if I were stupid, I would be intelligent enough to recognize it. Try again Opie. This bizarre attempt at making Rachel Maddow out to be a baying and unapproachable talking head – a lefty version of Glen Beck or Bill O’Reilly – is utterly and nonsensical, and ois surely an indicator that you listen to her right wing critics far, far more than you actually bother to watch her show. Maddow is constantly trying to get right wingers & republicans on her show. When she succeeds, she’s extremely gracious and limits her attacks to policy. Sure she may have a bot of fun with the odd gaffe, but she does in in good humor – there’s not a trace of hate or aggression against republicans in her shows… and most importantly, clearly she places huge value on honesty and research. Contrast that to O’Reilly and Beck – or anyone on Fox. She is not the lefty version of any of them: take away the ideological differences, and one gets a very honest, very friendly, slightly geeky policy wonk. You do not get anywhere close to Beck or O’Reilly. Or Maher, even. Who, yes, is more aggressive, but he also is not the unapproachable person you seem to think he is – you do know his show makes a point of inviting republicans, right? Does that really scream unapproachable cult member to you? I know there’s a bunch of people who(bizarrely) consider themselves centrists, who like the idea that Maddow is O’Reilly and both sides do it and both sides are just as bad as the other. But it’s a fantasy, and for any intelligent person capable of critical thinking skills, it’s a dishonest fantasy. Thanks for reading the post and replying. I understand your thoughts about Beck/O’Reilly vs. Maddow/Maher, and I agree with your points, but that’s not what I was getting at. I did not mean to say that Maddow and Maher are “as bad” as Beck and O’Reilly, only that they are all bad in the same way (not to the same degree). Yes, Maddow and Maher are far more civilized hosts than Beck and O’Reilly. They do both routinely invite on Republican guests, and when they get there, they treat them with more respect. But I can’t help but feel that neither Maddow nor Maher – nor Beck nor O’Reilly – are actually interested in understanding the other side’s perspective or in having a real, solution-based conversation with the other side. I am a left-wing liberal, but I am NOT of the belief that Republicans are crazy, stupid, or just selfish. I think many Republicans, albeit not those that we routinely see on cable TV, are traditional conservatives. They don’t think government functions well, and they would rather see the private sector try to solve our problems. Do I agree with that sentiment? Not most of the time. I am a Great Society Democrat, and I believe that our social safety net should be strengthened. But I respect that perspective, and I think that our problems are far too big – and our nation far too divided – to vilify each other in order to win elections, especially since I am far from convinced that the Democratic party is willing to take the risks necessary to effect big change. These shows – and mainstream politicians, in general – seem to be only interested in pleasing those who already support them, and that’s not going to help make our country better. I just don’t think it can happen that way. To be fair, there are far worse offenders that Maddow and Maher. I probably should have said Ed Schultz and Al Sharpton because, while I agree with their perspective on the role of government, I find their shows to be completely lacking in educational value. They cherry-pick facts, and they insult Republicans. Maddow and Maher are better than them, but neither one of them is interested understanding Republicans, only in denigrating them. And in the long run, that’s just not going to be enough. That is simply not true., and it’s points like that you make which show that you clearly do not watch them. Maddow in particular is very overtly trying to understand republicans – and she is most certainly not all about denigrating them. As to your points about Sharpton and Shultz: there’s a reason why they’re not very popular. As opposed to Beck and O’Reilly. But of course, you needed to make your point, so you decided to use the popular liberal political people, who are simply not an honest or accurate example. This is why fake centrism has no future : you simply cannot make an honest argument. I do watch Maddow from time to time, but you seem a bit defensive, so I’m going to stop this here. I really only wanted to give my perspective on the film and what it has to say about our culture. I’m not interested in a political argument. Thank you for reading. So despite the facts, you’re going with your gut feeling that Maddow doesn’t REALLY care? And not a single mention of the factual accuracy of Maddow, and the factual inaccuracy of FOX. Clearly facts mean nothing to you, rendering everything you write not worthy of reading frankly. Is this what you have to do to get a real job in the ‘real’ media? It’s dying anyway dude, if I were you I’d keep my self respect, but hey, whatever floats your boat. So you should have gone with Sharpton and Schultz……why again? The hand gesturing? The raising of voices? I hope that helps a little bit because that’s precisely what’s happening here. Maddow was a lousy example to use but people aren’t perfect and occasionally use lousy examples. It happens. The dignified thing to do is then acknowledge it and say, “Yeah, you’re right. I’m going to edit the post and put someone else in there instead. Maybe so and so.” Instead, you doubled down and accused someone trying to address the problem as getting defensive. What makes this whole thing sadly humorous is that’s exactly the kind of belligerence you’re bemoaning in the Beck/O’Reilly example. As to the film, I can see viewing it as an allegory for America but just because something is an allegory doesn’t make it good. I thought Phoenix and Hoffman were superb but the film meanders into nothingness for the last hour. The first commenter, riverc, has it right. In fact, that comment works as a great review of the movie itself. Thanks for reading and for your comment. I’m not going to apologize or change the examples cited in my post because I stand by them. I do think that Ed Schultz and Al Sharpton are BETTER examples of what I was talking about, but I still think that Bill Maher and Rachel Maddow do not provide a venue in which solutions our possible, and that’s the point I was trying to make. The reason I used them as example is because they are considered more mainstream, and thus I felt it was more important to point out their failings. I used to watch Maher and Maddow religiously (I hope they, especially Maher, will pardon my word usage), but eventually I grew tired. It seemed like all they were good for was giving talking points to liberals having arguments on comment boards with conservatives. That does not interest me. We are at a place in our history in which simply pushing back against Republicans does not seem a viable option. There are reasonable people within the Republican party, and I don’t believe that it is helpful to vilify them. I say this as an old-school, dyed-in-the-wool liberal, not, as some in this post have suggested, a new centrist. In other words, it’s not the ideas for which Maddow and Maher advocate I disagree with; it’s the way that they are presented. “Robertson,” not “Robinson.” And the “why” in the first sentence, second graph, should be “one.” No one will ever usurp my powers as the typo king. “Through this tumultuous relationship between two very strange men, Anderson asks his audience what a person – and a nation – are to do when they come face-to-face with the world’s darkness.” I like this basic interpreation. Together, There Will Be Blood and The Master seem to deal with the idea of how we respond to the feeling of disorientation caused by the darker corners of the world we’ve created and the times we live in: Does it make you insane like Freddie Quell and Daniel Plainview? Does it make you insulate yourself with ridiculous ideas and false idols as Dodd and his wife do? That was my takeaway from the film. What stands out to me is how Freddie progresses as a person by films end. *SPOILERS* The final love (lust?) scene shows a relaxed and tender Freddie contrasted against the volatile, docile and drooling mess of flit shown toward the beginning. This scene follows briefly after his return home to search for his lost love. His conversation with her mother is cordial and handled with relative restraint. Closure was reached not only from that but from him also looking the Master in the eyes and laying to rest the unending tension in their relationship. The movie has a much more hopeful ending than it is given credit for. Great thought. And maybe what Freddie sees in Dodd during his final confrontation is that Dodd, too, is serving a master – his wife. It is almost as if Freddie is a child who has finally come to undertand that his parents don’t have all the answers. used to be totally right. This put up truly made my day.